OS grid reference: SE 3900 4609. At the north-east side of Collingham village, west York-shire, stands the ancient parish church of St Oswald, a building dating back to pre-Conquest times. The church houses two Anglo-Saxon cross-shafts and also a few other interesting antiquities: there is an ancient stone coffin lid, a cresset stone, a stone with a consecration cross and some 17th century grave slabs. St Oswald’s parish church is located on Church Lane just to the north of the Leeds to Wetherby road the A58 (Main Street), and the river Wharfe is 100m to the north of the church; the village of Collingham is now regarded as a suburb of Leeds – the city centre being about 2 miles to the south-west. The taller and more impressive of the two shafts which stand at the east end of the aisle is called ‘The Runic Cross’ or ‘The Aerswith Cross’, and may date from the late 9th century AD. This is made up of two sections joined together. It is carved with three intertwined dragons, two of which are in opposition to the other. These creatures are of the Viking “Jelling” style of designwork that was flourishing in the 9th-10th century AD. There is also scrollwork, interlacing and knot-work which is more Anglo Saxon in origin. 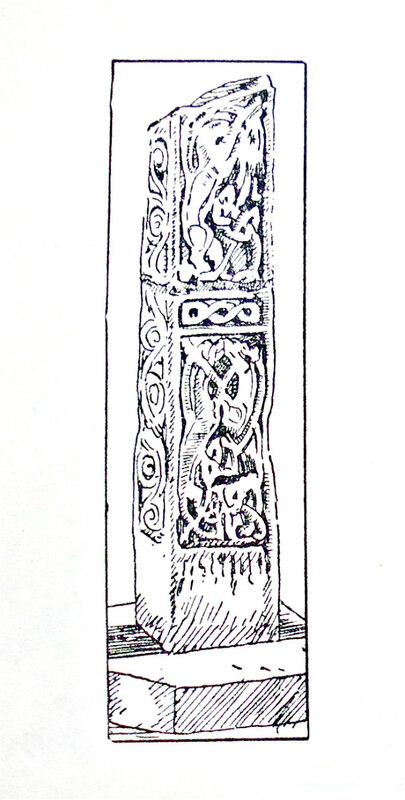 Around the base of this shaft there is a runic inscription which has not yet been deciphered. According to the authoress Ella Pontefract in her delightfully beautiful work ‘The Charm Of Yorkshire Churches’, this stone cross….. “has been thought to have been used at the dedication of a monastery built by Queen Eanflaed in the 7th century in memory of Oswini whom her husband had caused to be murdered.” Pontefract goes on to say that “the finding of the runic cross has also been thought to indicate Collingham as the site of the monastery of Ingetlingum, not Gilling, as Bede recorded.” W.G. Collingwood (1854-1932) the English author and antiquarian, however, does not find the name, Oswini, on the runic inscription, and so he dates the cross as late as the 9th century AD, the Transitional period between Anglian and Danish. St Eanflaed or Enfleda (d 704) was the daughter of King Edwin of Northumbria. She was abbess of Whitby. In 651 her husband King Oswiu of Bernicia murdered his own brother, Oswini, and Eanflaed then persuaded her husband to found the monastery of Gilling in reparation for his sins. In 670 after her husband’s death she became abbess of Whitby, north Yorkshire. Glastonbury Abbey ‘claimed’ to have the relics of St Eanflaed (David Farmer, 2004). The first abbot of Gilling, west Yorkshire, was called Trumhere. Some scholars think the monastery of Gilling was in North Yorkshire, near Ripon? The shorter cross-shaft is called ‘The Apostles Cross’ and, like the Runic Cross, it was dug up from the floor of the church during restoration work between 1840-41. It is said to date from the beginning of the 9th century AD. This shorter cross-shaft is made up of two sections joined together, and is so named because it is adorned with representations of eleven Apostles with halos and each in their own round-headed arch. 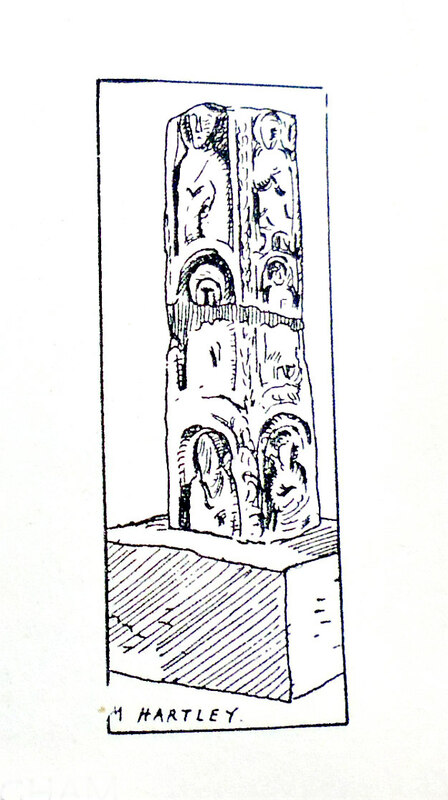 It is quite probably part of a much taller Anglian cross – the top section of which is missing. However, it is conject-ured that two of these ‘Apostolic figures’ could perhaps be representations of Christ, and the Virgin Mary with the Christ-child? There is also cable-pattern moulding design. The date of this cross had been fixed at about 800 AD, although it is generally now considered to date from the 9th-10th century AD. Also housed in the church is a cross-arm and sections of other crosses, which again date from pre-Conquest times. Farmer, David, Oxford Dictionary Of Saints, Oxford University Press, 2004. Pontefract, Ella, The Charm Of Yorkshire Churches, The Yorkshire Weekly Post, Leeds, 1937. [The two illustrations of the cross-shafts in Collingham church are by Marie Hartley, daughter of the authoress Ella Pontefract]. Categories: Ancient Crosses | Tags: St Oswald's Church at Collingham in West Yorkshire, The Collingham Saxon Crosses in West Yorkshire | Permalink. is it runed though? we know a lot more about furthark / futhorc development now.